As you know, I am an unregenerate tinkerer, always altering my clothes. I often forget to show you “BEFORE” photos and therefore will try to do better in 2017. This is me doing better. Writing this blog is an on-going exercise in self-reflection and one of the things that I have realized is that my life, depending on one’s perspective, could be described as a never-ending search for white shirts. The life expectancy of a white shirt is so short that as soon as I buy one, I begin thinking about its replacement. I found this white dress on YOOX, but I think it will make a perfect white top — to wear under sweaters or jackets. I fully admit that I appear to be wearing a shower curtain. But trust me; this dress will be an extremely useful and appealing layering piece when it is shortened to the top of my thighs. Interestingly, the care label has dire warnings. The author did not think it was sufficient to advise: Dry Clean Only. I have additionally been warned: DO NOT WASH IN WATER. I’ve read a lot of care labels, and I’ve never seen that instruction before. Could there be an eLeCTriCaL cuRReNt running through this dress? 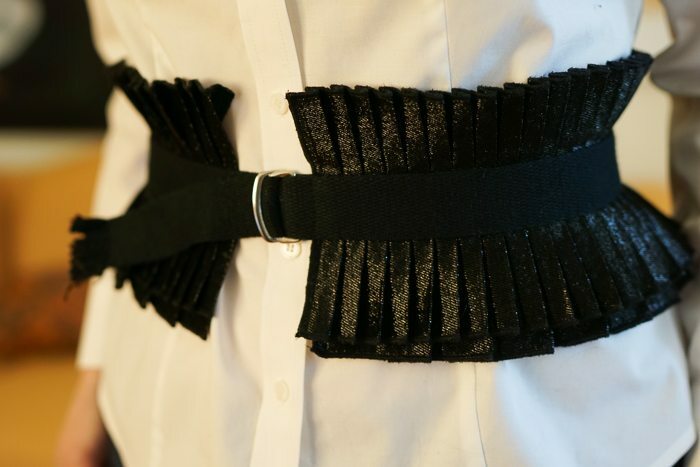 I recently did a Google search for corset-style belts — something wider than a belt but smaller than a bustier — and want to advise you to tread carefully if you attempt the same. 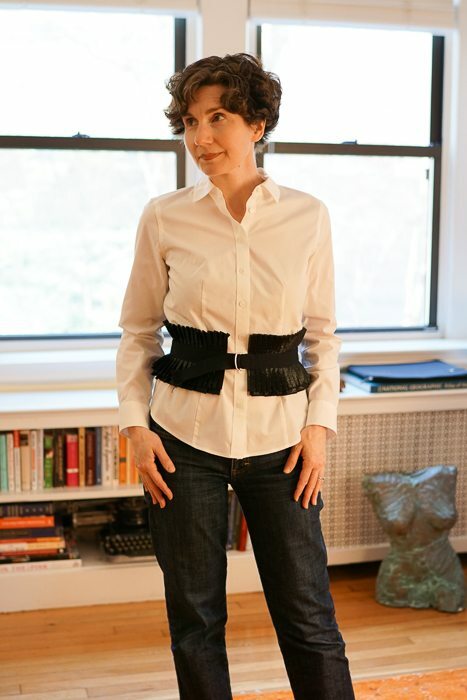 You will see a lot of things that are NSFW — NSF wearing to work, N even SF looking at while at W.
There is a part of me — a big part — that wants to buy this Uline belt and wear it to work just to see if anyone would dare say anything about it. This . . . apparatus . . . is made of soft pleated fabric, which is black with metallic threads running through it. It’s kind of sumptuous, isn’t it? I am not sure if it is supposed to close completely at the front, or if this gap is O.K. I may have to fix the end of this twill tape closure; it’s frayed and, again, I am not sure if that is an intentional design or just damage. And finally, for those of you who’ve been wondering about my kitchen chairs: They are here! They are very comfortable. The Photographer likes zipping up and down our kitchen in his chair and I fear that eventually there will be some horrible cat or human injury. I am quite pleased with them. “Quite” in the American sense — which means “really” (which would be pronounced “rilly”). 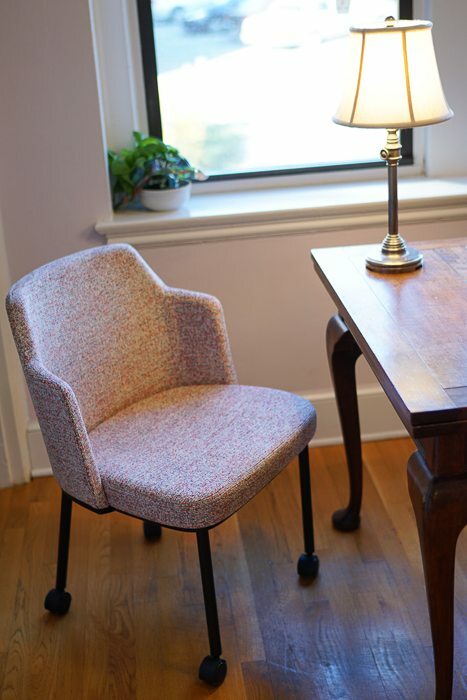 It turns out that having the chairs upholstered at the factory with my own fabric would have added a couple of months on to the lead-time, so I opted for a Knoll fabric and will have slip-covers made this spring. 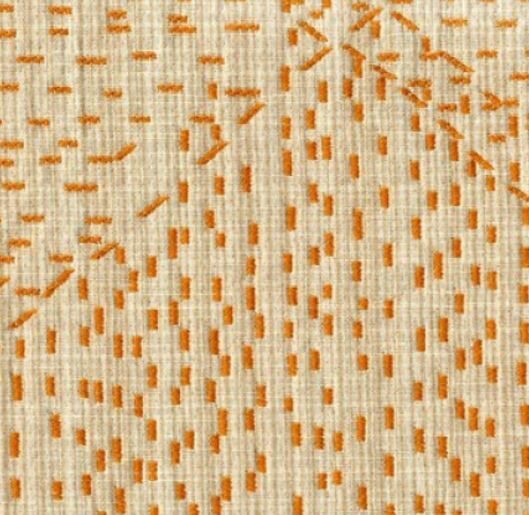 After putting a number of choices in front of you, I have a new idea for fabric: Satsumi by Donghia. I really want you to wear that back support to work and report back to us. Please? I actually would like one to wear right now, today, because my back feels sooooo tired. Thank you, Hope! It’s an old JCrew sweater, which I really think they should re-issue. It may have been called the Femme Cardigan. With regard to weak and broken body parts, there are days when I feel that a neck brace would be very helpful. My head is so heavy . . . I think the back support looks great. Maybe the buckle is supposed to go on the back? Perhaps you’d also like to try a black nappa leather obi belt with the white shirt. I wear mine always to great accolades. Otherwise, I’m not really a fan of the electrifying messianic shower curtain. But I like the chairs with the wheels! The black leather obi belt is so chic, Caroline — and it works with a wide range of silhouettes. An excellent tip! I’m thinking the shimmery white dress/shirt may have some kind of coating on it that water would tamper with… and yet again, I test fate. When you do get it chopped, conduct some experiments with laundering on your own! I’m thinking the pleated cumberbund could also serve as a cowl neck scarf garment… like the fur one I replicated from a previous post of yours. Bunching it up at the neck may bring you joy and look Elizabethan-ish. Or wear it backward with the closure in the back! I can’t wait to see what you do with this piece. So dense am I, I didn’t realize you were suggesting that I keep the remnant for laundry testing until I read Ginger’s comment below. SUCH a good idea, Sharla. 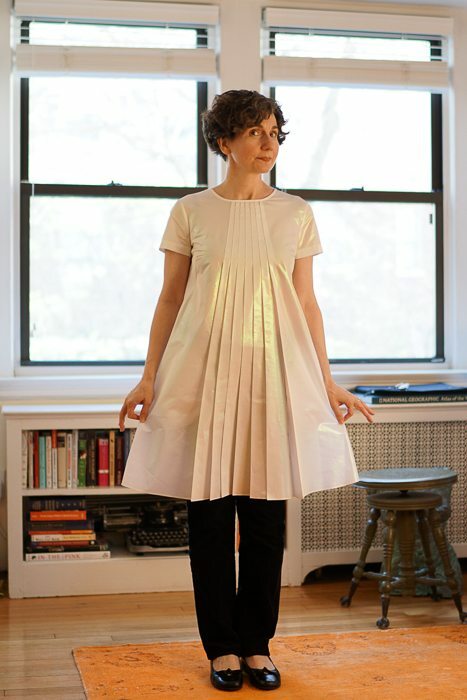 I’m with Sharla that I’d hold off trying to wash the dress/tunic until I’d tested a scrap. Having had three children and retained an unfortunate belly pouch, I personally would never consider either of those pieces, but they do look lovely on YOU, Directrice. 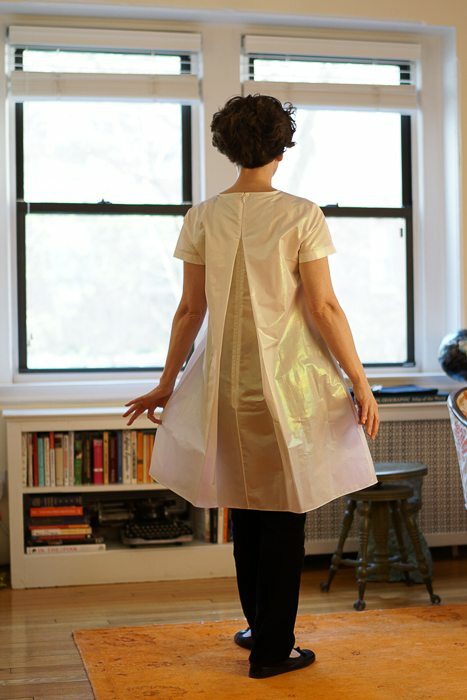 Also agree – ask for the removed fabric back from your seamstress so you can experiment with washing techniques. I do see it with a flowy shirt, MGT. Perhaps with our blue willow blouse? 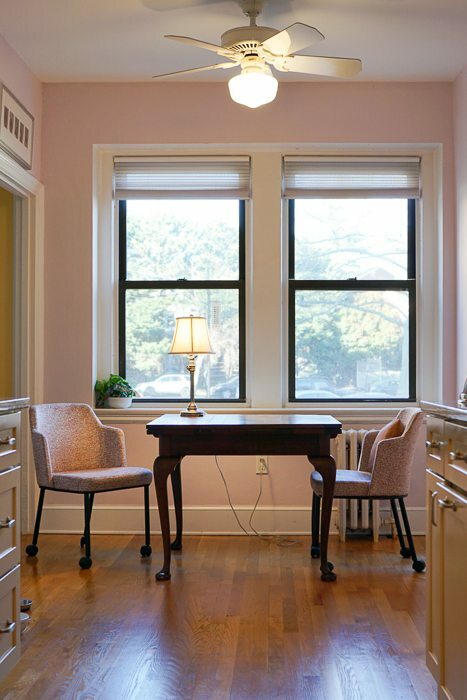 Never mind the kitchen chairs, that upholstery fabric would be perfect made up into a little 60s-style shift dress. It is too bad about the shower curtain fabric, because I actually like the thing as a dress. But at least you can be sure it is not really shower curtain fabric, since it can’t handle water! The other shower curtains would sniff it out immediately. The Isabel Marant thing – would you wear it in Real Life with the white shirt, or was that just the backdrop for the photo shoot? Seems to me it oughta go with something more flowy / less structured. When the Photographer crashes, you’ll have a reason to buy the Uline belt, and then you can borrow it from him to wear to work. 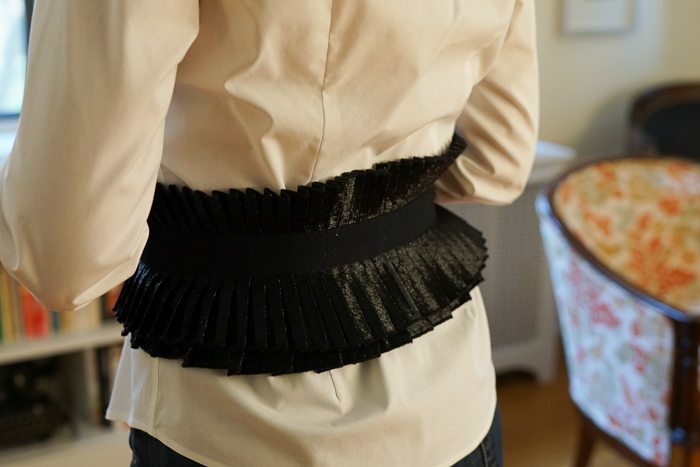 May I suggest doing a search for obi belts, especially on Etsy? Although I love the crisp frills on the Isabel Marant belt, so you might not wish to continue your search. Also, I’ve read in at least one book as well as a couple historical fashion blogs that less tightly laced corsets provided welcome back support for working women. Etsy is a great idea, Eva! Last summer Helmut Lang showed these kind of shapeless black dresses cinched with obi belts in a vivid blue foulard fabric — and the awesome belts weren’t actually for sale. Etsy! If you’re already thinking of hacking off the “electrifying messianic shower curtain,” perhaps you’d also consider basting in some waist-respecting side seams, to see how that looks? 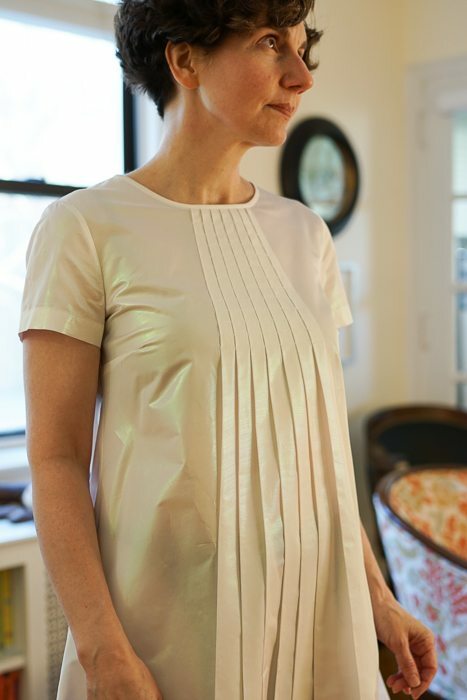 Your tailor could use large running stitches, or even just pins, to give you an impression of how the dress/shirt might hang on your body if it were less voluminous. 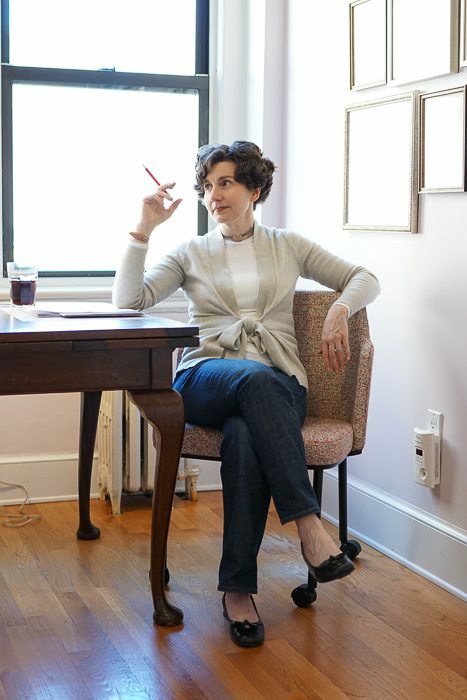 Your blog supplies ample evidence that you appreciate voluminosity, but a little less of it here might better flatter your enviably trim figure. Just my two cents, so if you want to keep voluminizing, get on with your bad self!